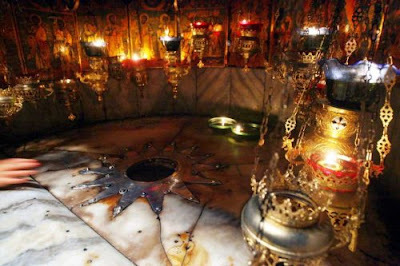 The silver Star marks the exact spot, according to tradition, where Christ was born in Bethlehem. For if you can learn what the star was, and of what kind, and whether it were one of the common stars, or new and unlike the rest, and whether it was a star by nature or a star in appearance only, we shall easily know the other things also. Whence then will these points be manifest? From the very things that are written. Thus, that this star was not of the common sort, or rather not a star at all, as it seems at least to me, but some invisible power transformed into this appearance, is in the first place evident from its very course. For there is not any star that moves by this way, but whether it be the sun you mention, or the moon, or all the other stars, we see them going from east to west; but this was wafted from north to south; for so is Palestine situated with respect to Persia. In the second place, one may see this from the time also. For it appears not in the night, but in mid-day, while the sun is shining; and this is not within the power of a star, nay not of the moon; for the moon that so much surpasses all, when the beams of the sun appear, straightway hides herself, and vanishes away. But this by the excess of its own splendor overcame even the beams of the sun, appearing brighter than they, and in so much light shining out more illustriously. In the fourth place, one may perceive this clearly, from its mode of pointing Him out. For it did not, remaining on high, point out the place; it not being possible for them so to ascertain it, but it came down and performed this office. For you know that a spot of so small dimensions, being only as much as a shed would occupy, or rather as much as the body of a little infant would take up, could not possibly be marked out by a star. For by reason of its immense height, it could not sufficiently distinguish so confined a spot, and discover it to them that were desiring to see it. And this any one may see by the moon, which being so far superior to the stars, seems to all that dwell in the world, and are scattered over so great an extent of earth—seems, I say, near to them every one. 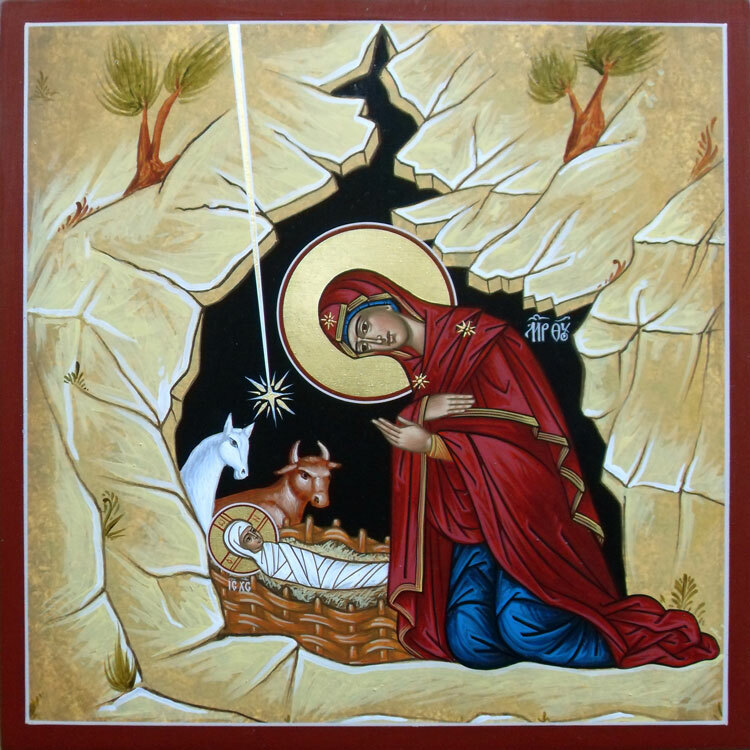 How then, tell me, did the star point out a spot so confined, just the space of a manger and shed, unless it left that height and came down, and stood over the very head of the young child? And at this the evangelist was hinting when he said, "Lo, the star went before them, till it came and stood over where the young Child was." Do you see, by what store of proofs this star is shown not to be one of the many, nor to have shown itself according to the order of the outward creation? And for what intent did it appear? To reprove the Jews for their insensibility, and to cut off from them all occasion of excuse for their willful ignorance. For, since He who came was to put an end to the ancient polity, and to call the world to the worship of Himself, and to be worshipped in all land and sea, straightway, from the beginning, He opens the door to the Gentiles, willing through strangers to admonish His own people. Thus, because the prophets were continually heard speaking of His advent, and they gave no great heed, He made even barbarians come from a far country, to seek after the king that was among them. And they learn from a Persian tongue first of all, what they would not submit to learn from the prophets; that, if on the one hand they were disposed to be candid, they might have the strongest motive for obedience; if, on the other hand, they were contentious, they might henceforth be deprived of all excuse. For what could they have to say, who did not receive Christ after so many prophets, when they saw that wise men, at the sight of a single star, had received this same, and had worshipped Him who was made manifest. Much in the same way then as He acted in the case of the Ninevites, when He sent Jonas, and as in the case of the Samaritan and the Canaanitish women; so He did likewise in the instance of the magi. For this cause He also said, "The men of Nineveh shall rise up, and shall condemn: and, the Queen of the South shall rise up, and shall condemn this generation" (Matthew 12:41-42) because these believed the lesser things, but the Jews not even the greater.